[Updated with pic captions & conclusion] Strange bedfellows, the kinder critics called them. Hurtling towards mutual self-destruction, media stalwarts assured everyone. Cut from too different a cloth. Are we referring to Kim Dotcom and Hone Harawira? If you are a consumer of mainstream media, you could be forgiven for thinking so. Instead we are referencing that which acid tongues heralded as an end to an era of 4-piece perfection: the demise of the Great White Hope – the Beatles. Yoko Ono and John Lennon’s relationship became a constant churn of tabloid fodder. Unfounded speculation and undermining from every facet of the establishment became the standard governmental response to these two iconic maverick soulmates and political activists. Yet scratch the surface and the universal purpose of the Lennon-Ono collaboration is self-evident in their creation of many timeless treasures, which we now hand down through generations. Indeed it has become impossible to deny that the union which so many saw as ill-conceived and outside the box, produced incredibly strong musical content, some of which is considered to be amongst the greatest tracks of all time. For example “Imagine”, which manifested a single, an album, a documentary film, a soundtrack, and was eventually even featured in Rock Band 3. Rolling Stone Magazine placed “Imagine” at Number 3 in it’s Top 500 historically important songs of all time. The song won hundreds of accolades over the years, yet there is not a Beatle in sight on the track. It was entirely written and inspired by Lennon and Ono. The stark diversity of the Lennon-Ono partnership was one of the keys to its strength and intrigue, but also a primary cause of the general disaffection from the consumerist status quo, who could never quite get over seeing a rich white male with a non-white partner; let alone one that was an accomplished avant-garde.performance artist and activist in her own right, with her own following. Yet as always, the artistic results of the unfailing unity the coupling produced, eventually silenced the critics, as the music spoke for itself. What would this world be like if we had never heard the song “Imagine”? What would it be like if John Lennon had decided that his relationship with Yoko wasn’t worth enduring the constant mud-slinging, and had gone back to McCartney, tail between his legs? Or ditched Yoko for the first honey trap that came along? It is impossible to measure the social impact of a song like “Imagine”, with the millions of people it has inspired to reflect and hold with them, the principles contained within it. It is also impossible to measure the social impact of such a work having never existed. While we clearly are not intending to insinuate that either entertainment-industry mogul Dotcom or Mandela-confidante Harawira are Yoko and Lennon incarnate, it is a brilliant metaphor to demonstrate that unique creative partnerships can achieve feats that were previously unattainable. The efforts of combined inspiration and benefits of conjoined resources broaden the horizon of the possible, and what is possible is that the end result, becomes priceless to humanity. Dotcom’s willingness to speak directly to indigenous peoples of New Zealand and openly ask for their tautoko, their support, also makes the corporate media smears of him as some kind of amoral capitalist glutton who knows nothing of the plight of poverty, seem equally ridiculous. We had the pleasure of covering Mana’s Boots Riley show this week and got to spend a few hours with Boots who, within minutes, became like one of the family. We listened to Rage Against The Machine’s self titled album (1992) which includes the song ‘Wake Up‘, which was also featured on The Matrix soundtrack and played during its closing credits. He is right that Martin Luther King brought unity to millions of people; united them in struggle and empowered them through peaceful action to achieve monumental social-evolutionary wins for the benefit of current and future generations. Despite the massive personal cost can there be any greater success than to unite? “Imagine” was a song of unity. The Maori would say kotahitanga; oneness. But as with all Maori words there is much deeper meaning. “Kotahitanga reflects our physical and spiritual connection to this land, to the world. It reflects a dawning realisation (globally, not just in Aotearoa) that we are simply guardians of this land, that we are obliged to take care of it. Kotahitanga acknowledges that our sense of ownership has been superceded. We exist in Te Ao Marama, the Realm of Being, as part of a whole greater than ourselves. Kotahitanga asserts that we must let go of any sense of ownership, but that in doing so, we all get to have a share. Kotahitanga sends a message which reverberates around the world. It reflects an emerging spirit of sharing and understanding in humanity. A world where people of different origins, races and cultures can accept their differences without always understanding them, embrace and celebrate each others gifts and move together along a new path, together as one. 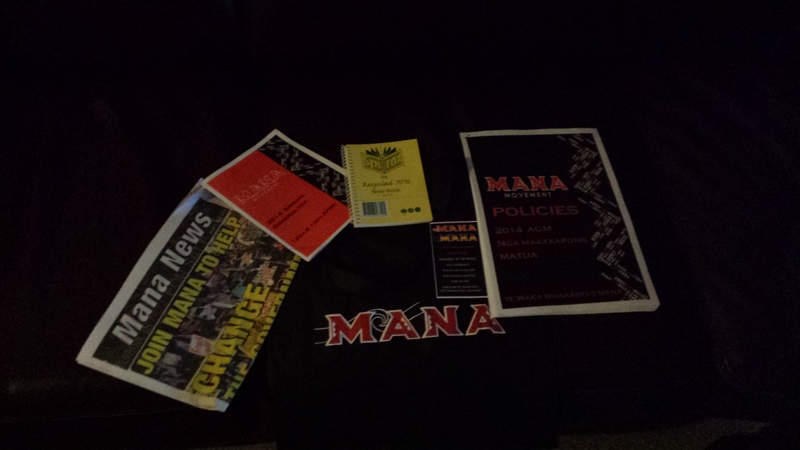 Unity was precisely what we witnessed at the Mana AGM and here is the Mana Wahine waiata (song) to prove that all the corporate media build-up to the meeting was little more than politically expedient hot air. 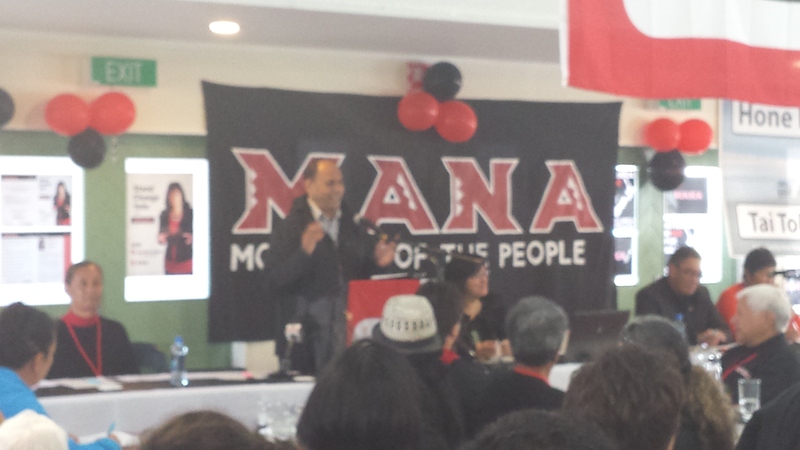 COVERAGE: Mana Party Annual General Meeting: Saturday April 12th, 2014. 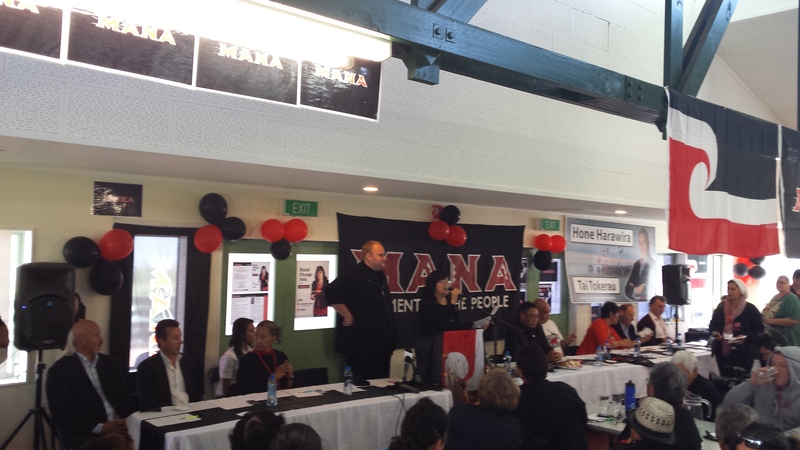 After a week of having watched both Hone Harawira’s Mana Movement of the People and Kim Dotcom’s Internet Party being publicly scapegoated across the full spectrum of corporate news radio and television stations, we could have been forgiven for expecting to arrive in Rotorua to find a small scale civil war occurring at the Mana AGM. Yet we didn’t expect that at all, and weren’t disappointed, as the smears of both Harawira and Dotcom have never been of sufficient substance to penetrate beyond the ever-dwindling numbers of New Zealanders who still believe anything their TV or radio tells them. What we instead found was an unequivocal solidity and political leaders prepared to sit and listen to their people, far beyond anything we’d experienced prior. 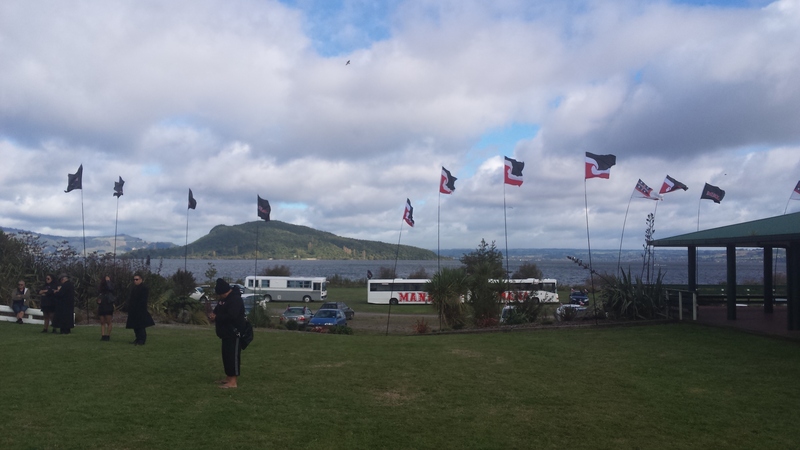 There is no more picturesque place for Mana to have held such important discussions, as the shores of Lake Rotoiti in Rotorua, New Zealand. #Mana buses brought those who couldn’t otherwise afford to travel or who just want the company, to the Annual General Meeting in Rotorua. Anti-fracking bumper sticker on a car in the parking lot. Fracking causes earthquakes & poisons groundwater with deadly chemicals. 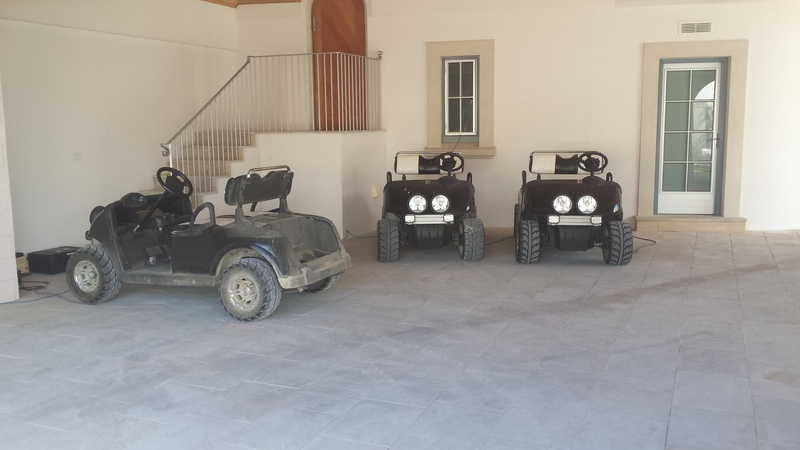 One free guess as to who that vehicle belongs to! 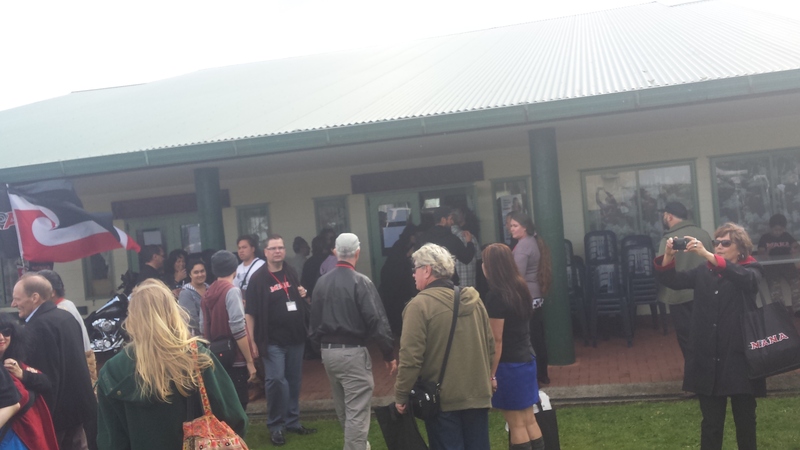 The media begin to assemble on the marae to film the proceedings. 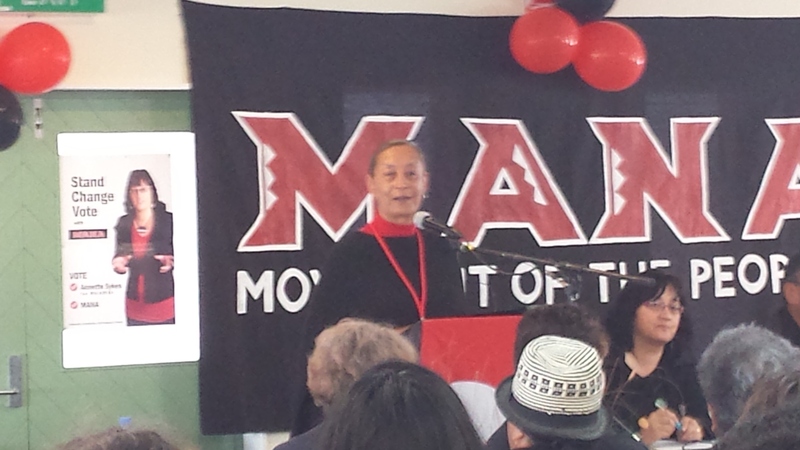 Elders from the host tribe, Te Arawa, listen to Mana leaders speak in their native Te Reo (the Maori language). 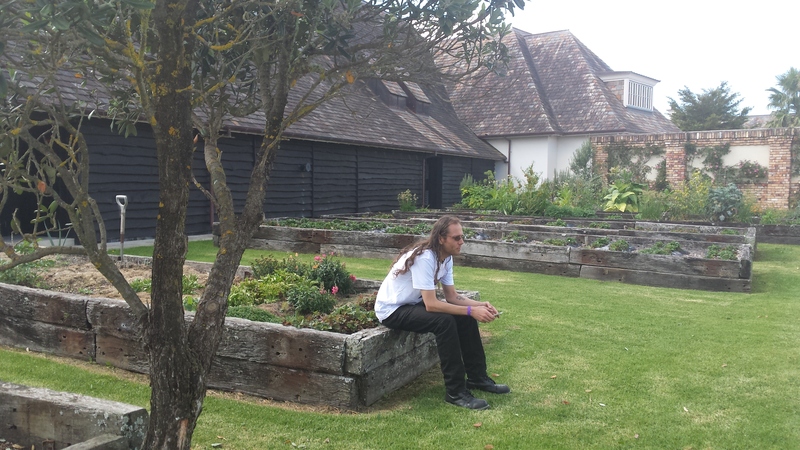 Hone takes a moment to reflect, after the powhiri (welcome). People mill around the meeting room that will house the events to follow. 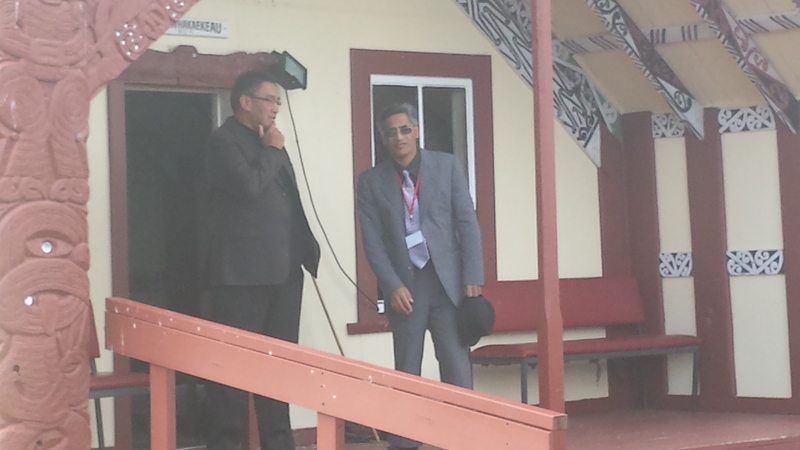 NZ radio jockey and long-time politico Willie Jackson addresses attendees. The incredible and gorgeous Georgina Beyer, the first transsexual member of Parliament in the history of New Zealand, delivers a frank recounting of her time in Parliament. Very interesting stuff and if someone has a video of her speech, we’d love to watch it again. Everything she said was well worth the time to listen. 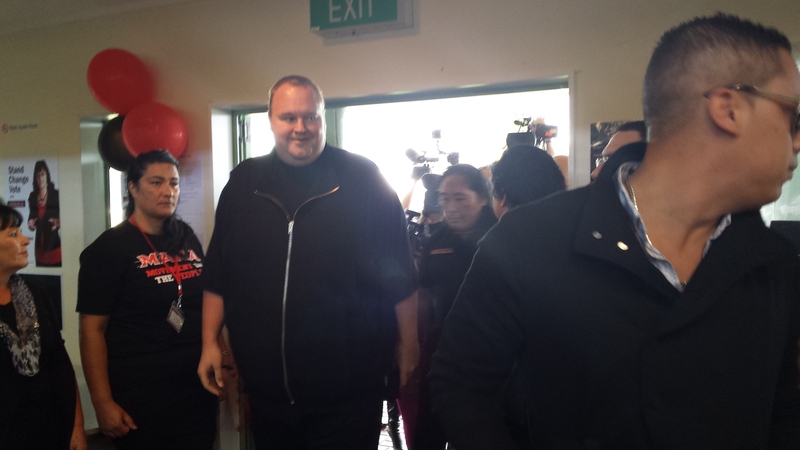 Kim Dotcom enters the meeting house. 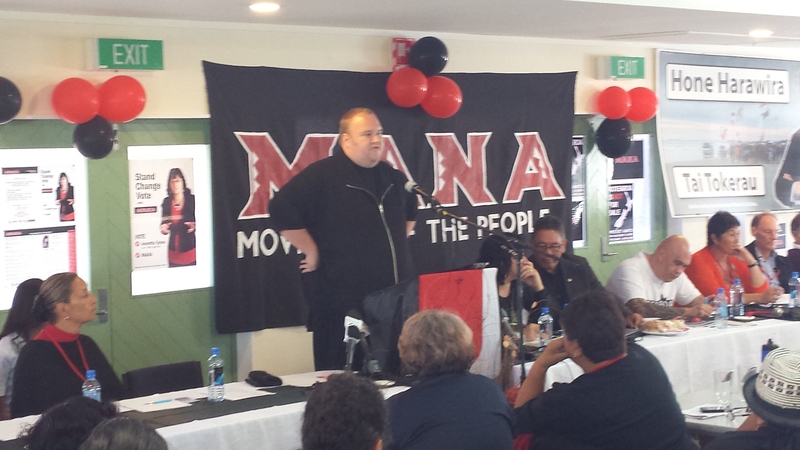 Kim Dotcom addresses the Mana constituents gathered to take their measure of him and the prospective proposal for an alliance between Dotcom’s The Internet Party of NZ, and the Mana Movement of the People. 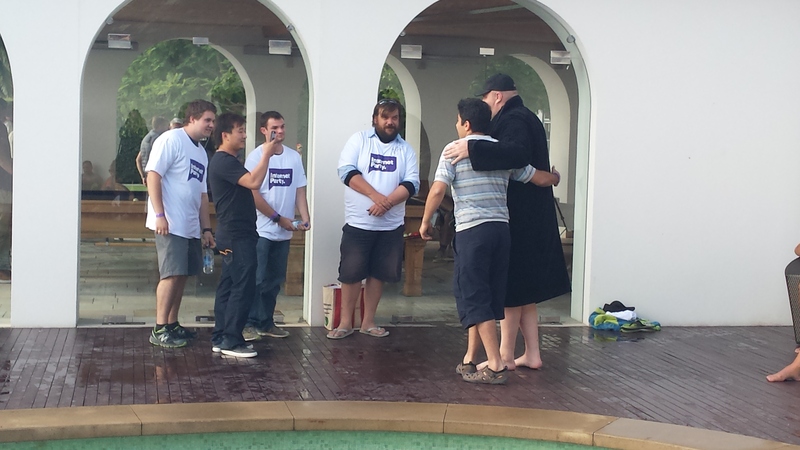 Kim Dotcom fields questions from each Mana rohi (chapter). Answers in the affirmative when asked by Mana Tamaki representatives if he supports the housing struggles at #SaveGI. Also states that he is against oil drilling and fracking in New Zealand. 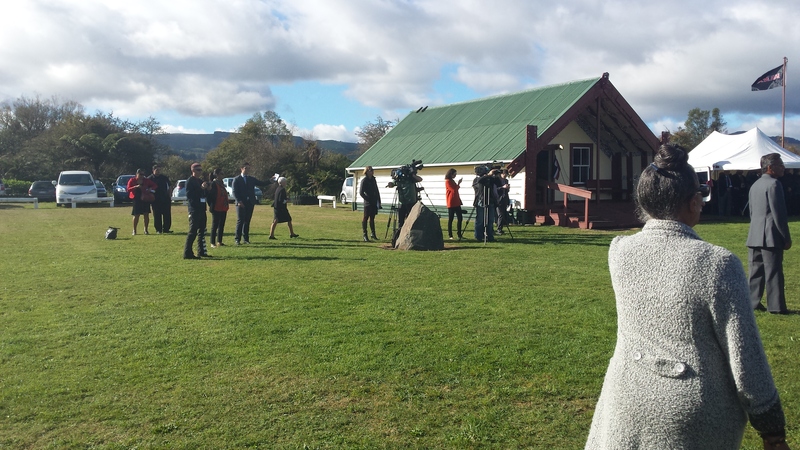 After lunch, pretty much the entire NZ press pack had assembled in a loose horseshoe formation on the marae waiting for Mana Movement leader Hone Harawira to emerge. By a chance twist of fate we got to him first, and Hone graciously accepted our interview request. To the astonishment of the onlooking corporate media, Hone led us to a quiet spot where we were able to capture the following footage, and cement his participation in our upcoming Web TV series: “Warriors of the Global Revolution”. Hone’s responses to our questions were inspiring and revolutionary. COVERAGE: Internet Party #IRLPicnic for a #SwimWithKim: Sunday April 13th, 2014. 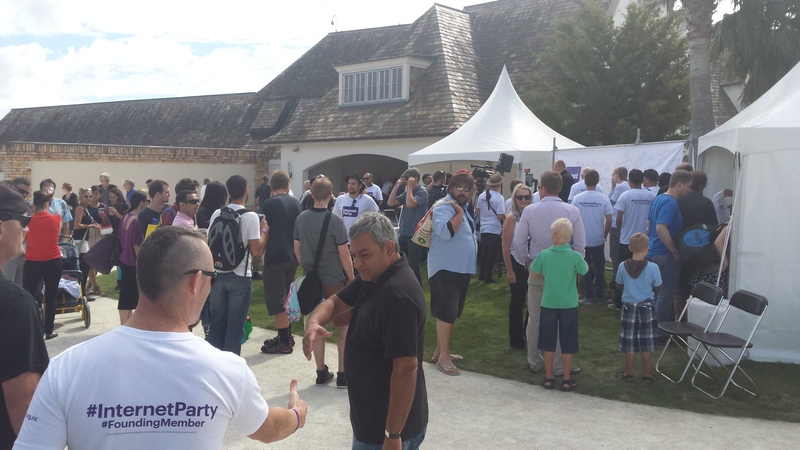 On a total whim that arose from the happenstance of seeing a late night release about it, we applied for media passes to the Internet Party‘s first members event, hosted on the ‘Mega’ Mansion grounds. We were pleasantly surprised when they immediately accepted and issued us press invites. 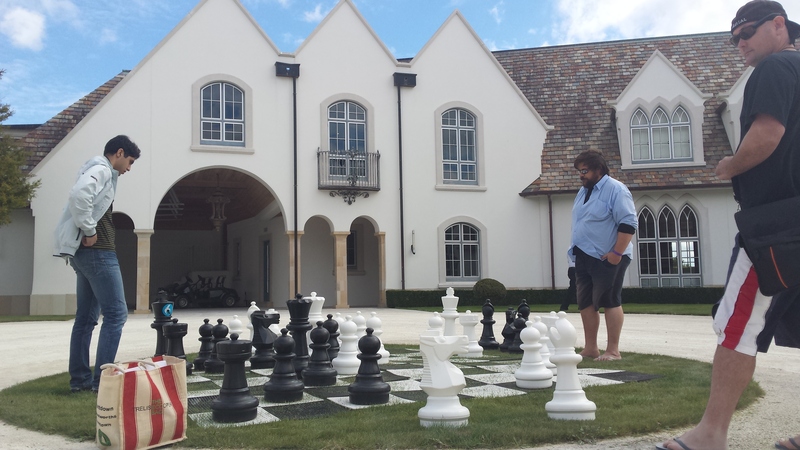 This, apparently, is where Kim plans his next chess move. 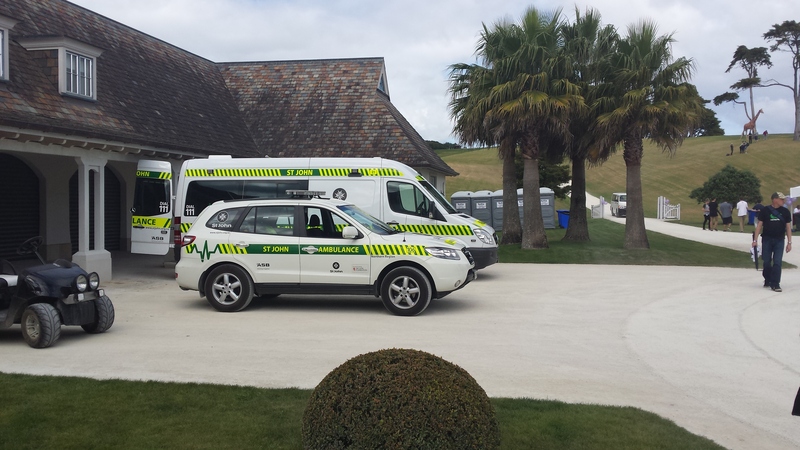 It was awesome to see St. John onsite in case of any accident or health issue. 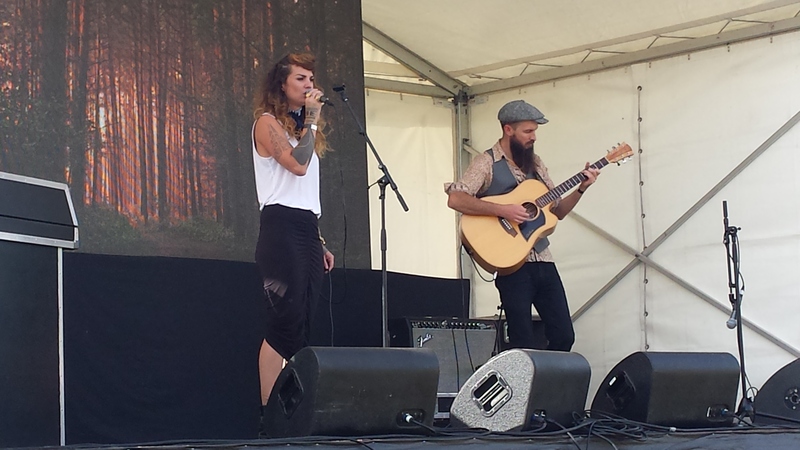 Accomplished NZ singer-songwriter Hollie Smith blew the crowd away with her incredible acoustic blues set. Kim continued to meet with Internet Party members one on one, for over two hours, before finally hitting the stage to give his speech. Up Truth; Up Democracy; Up Justice. 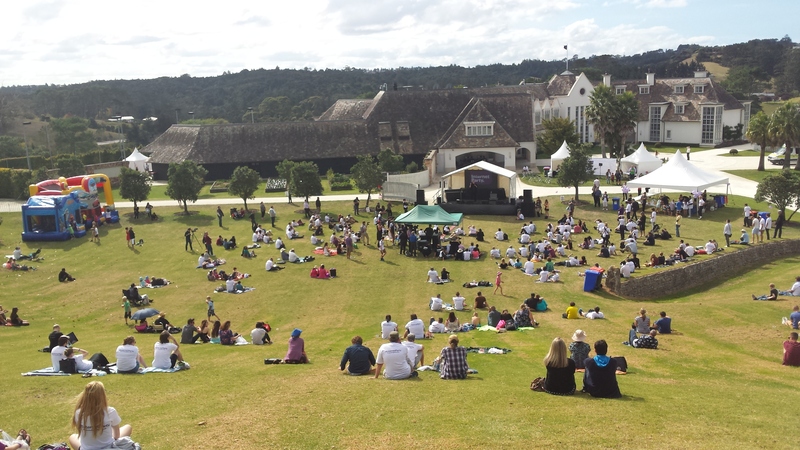 In lieu of an amphitheatre, this perfectly sloped hill provided the perfect natural contour for everyone to have a perfect view of the stage. 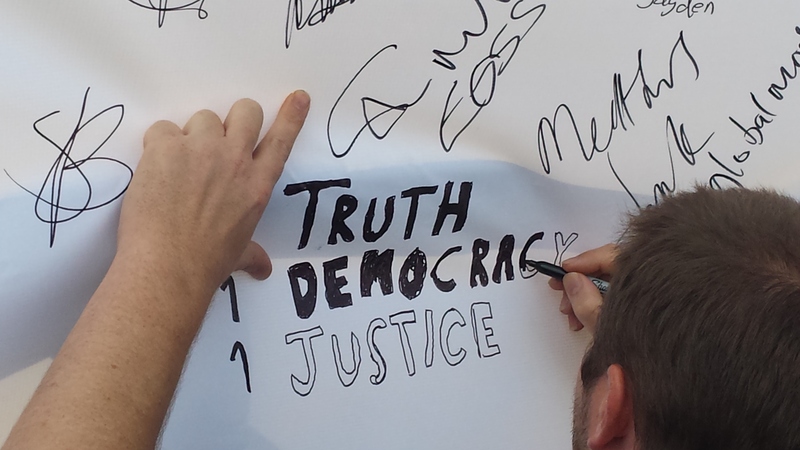 Internet Party members signed this huge banner, commemorating the event. Media were present and keen to squeeze out some stories but from what we saw, attendees largely treated corporate media as a nuisance and just wanted to get on with enjoying the days festivities. Everyone got a chance to have their photo taken with Kim, though we gladly forewent trophy pics for our video interview with him. 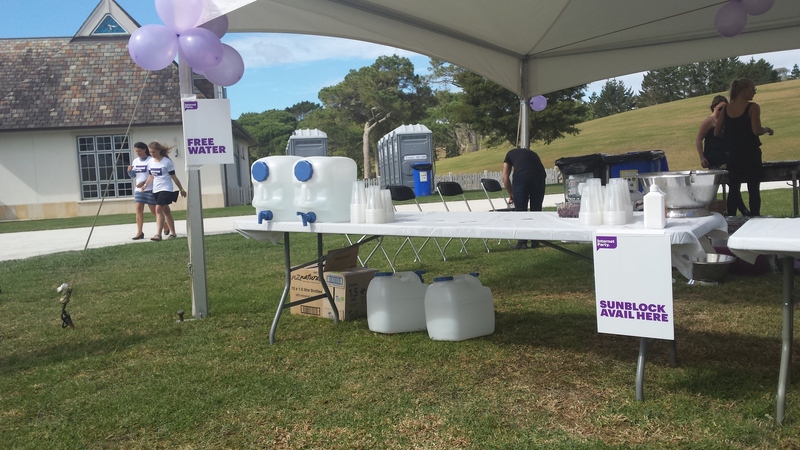 There was free water, sunblock and a sausage sizzle available throughout the day. 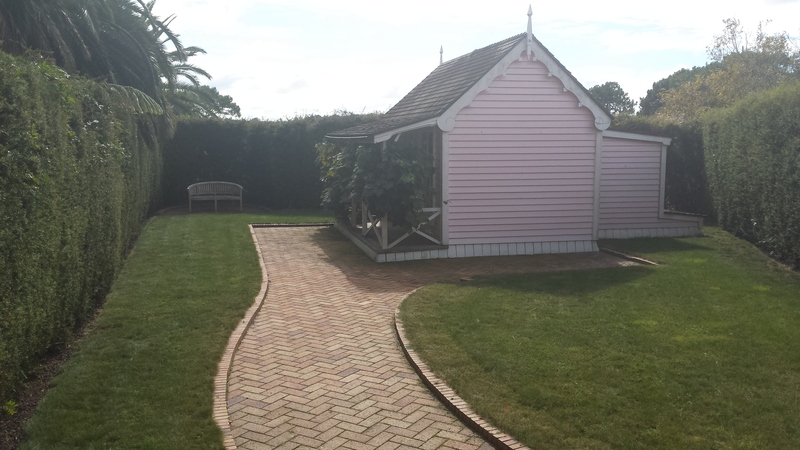 This cute playhouse/guesthouse sits in a quiet corner of the garden. 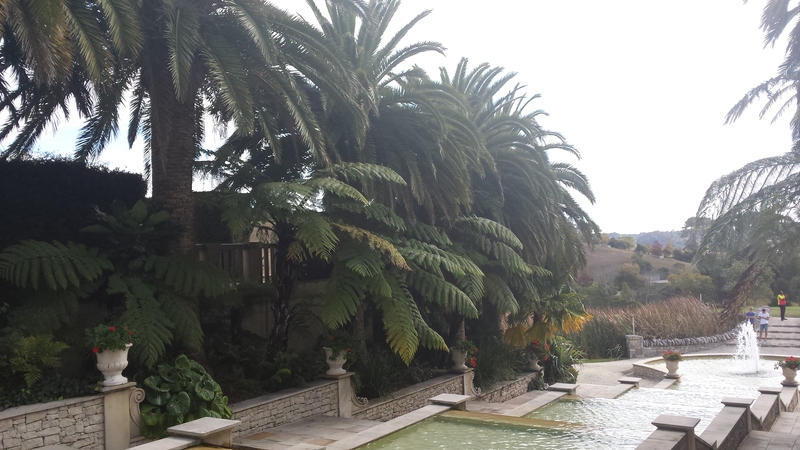 We were pleased to discover native NZ ferns and trees throughout the property. 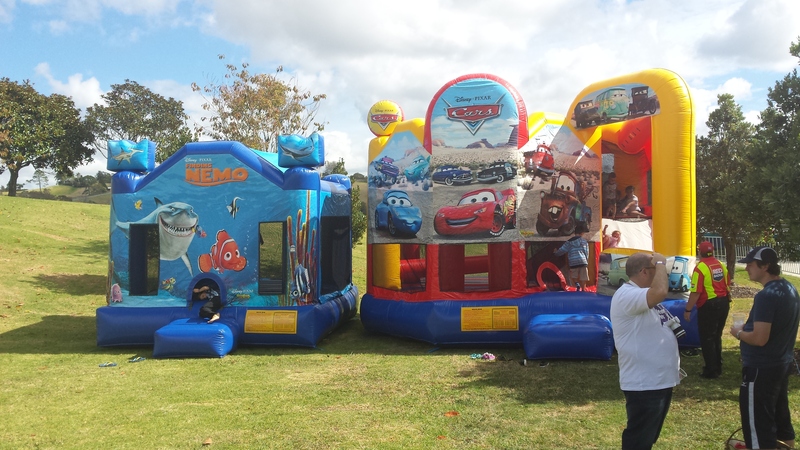 It truly was a family friendly day, with bouncy castles and other activities for the kids. 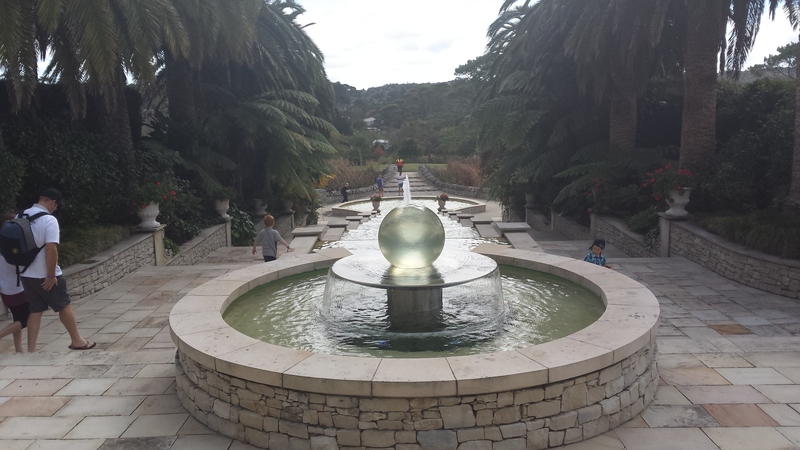 The big vege garden was one of our favourite spots. This guy was happy for us to photograph him chilling in it when we told him it was for Occupy New Zealand. 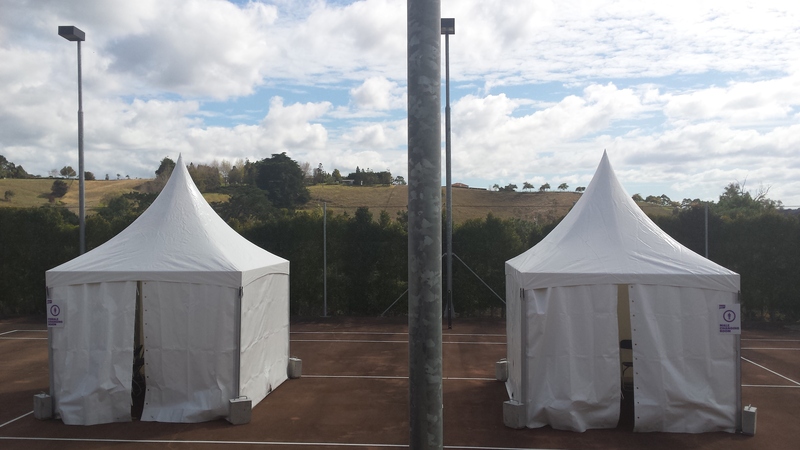 A necessary addition – his & hers changing rooms transformed the tennis court. 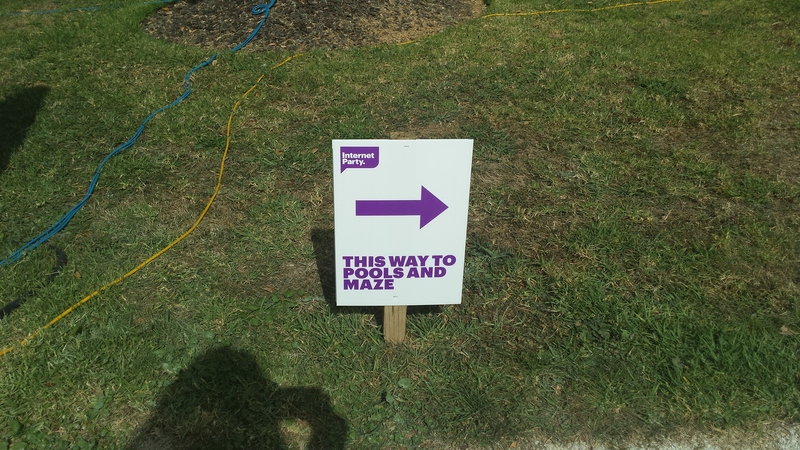 Custom-made Internet Party signs directed party-goers to the various attractions. 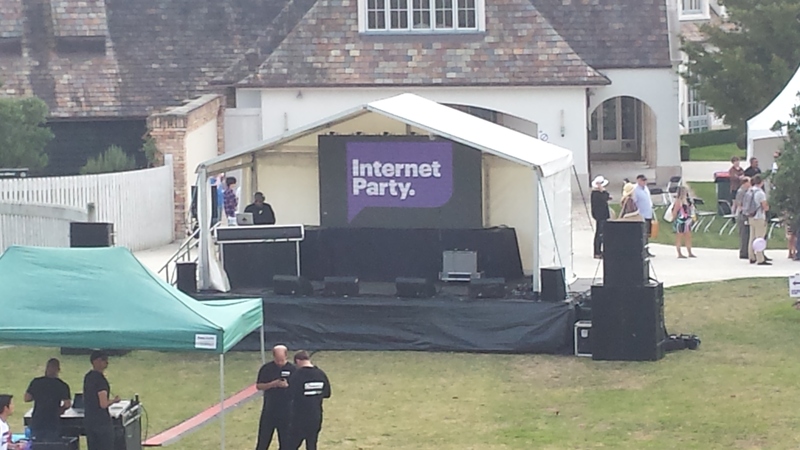 Everyone was given a free Internet Party t-shirt and most eventually put them on, creating huge swathes of purple-and-white everywhere we went. We didn’t realise until after we snapped this shot, but that is Mega CEO Vikram Kumar in the foreground. 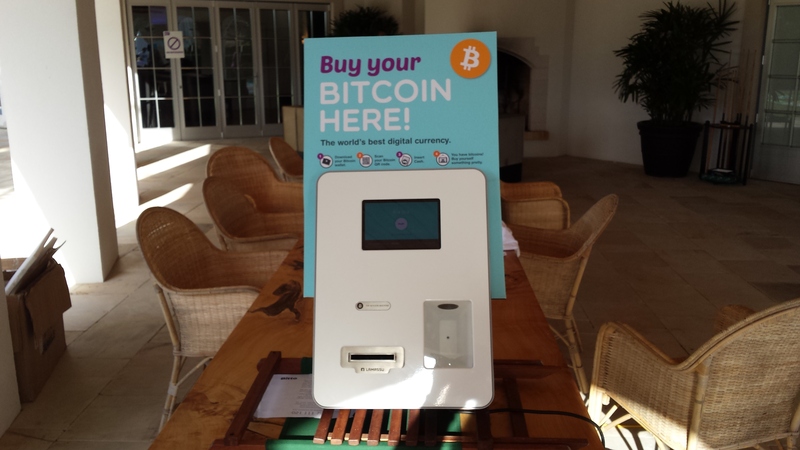 Tech-heads loved the Bitcoin ATM machine in the billiards room. 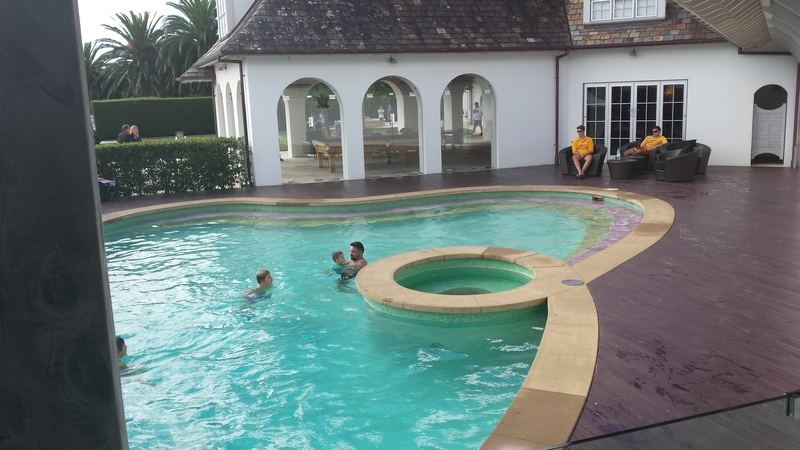 Kim by the pool, posing for photos with young supporters. As promised, those who wanted to, got to #SwimWithKim. 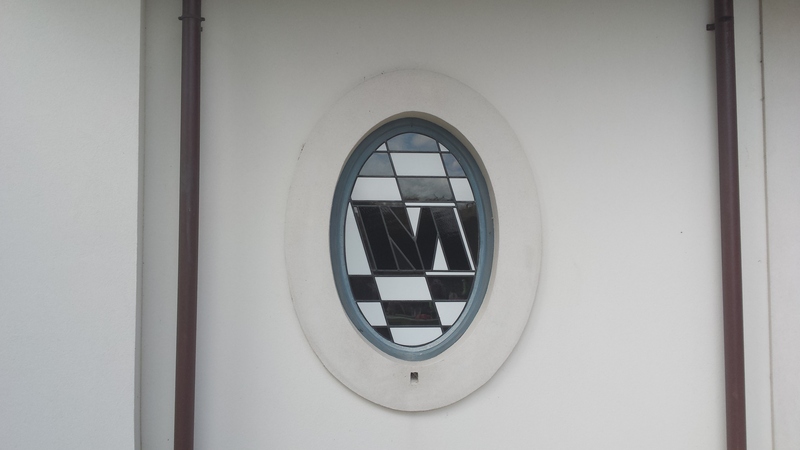 ‘Mega’ window at the ‘Mega’ mansion. 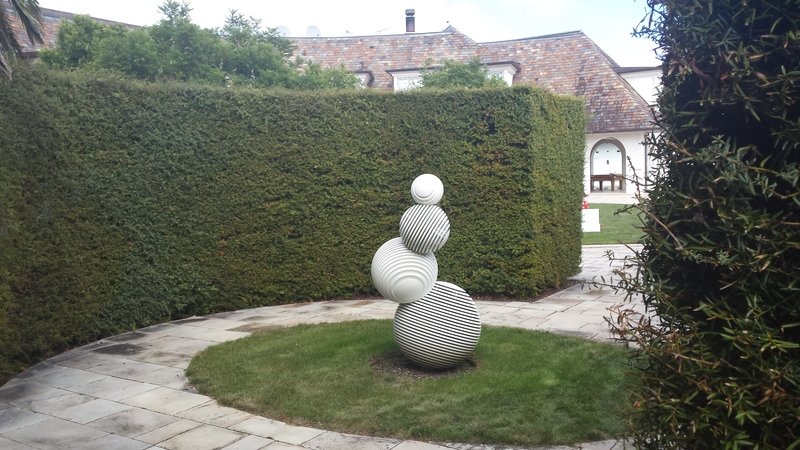 The physical impossibility of this statue seems somehow the perfect fit at the Mansion. A place where it is clear that unorthodoxy flourishes! 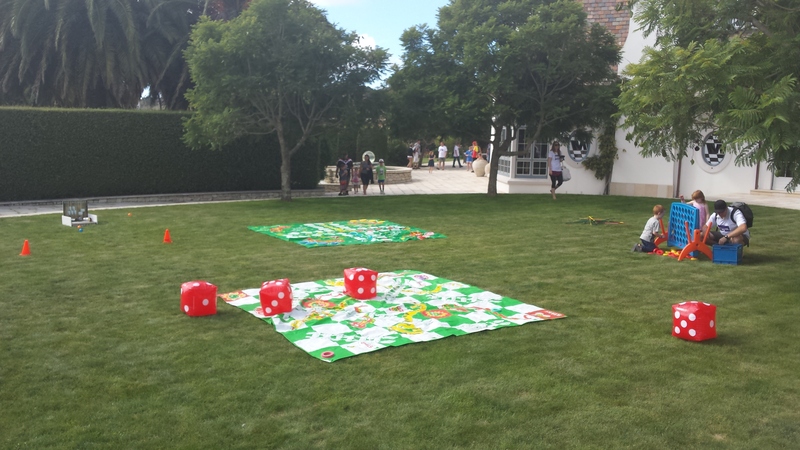 Super-size games for guests young children. 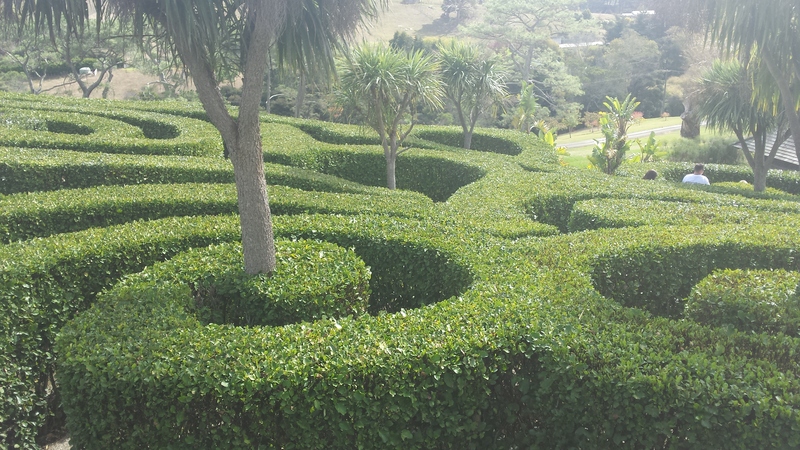 We were amazed to discover the hedge maze was a series of interlocking koru. 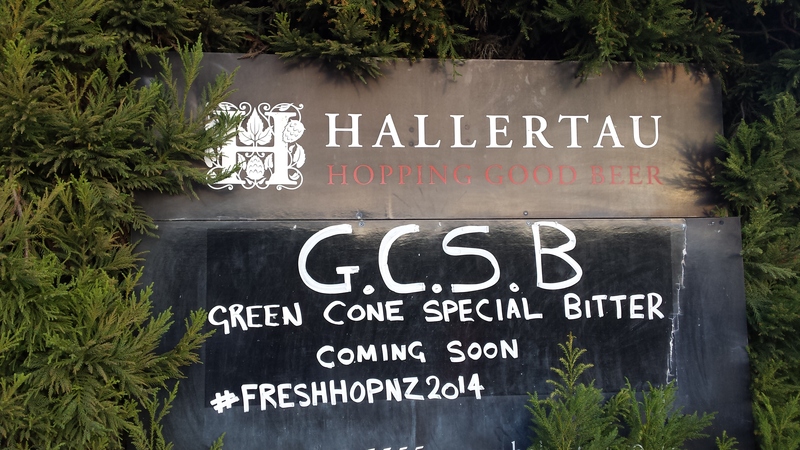 Sign outside the local Coatesville pub mocking #GCSB – (the NZ NSA). These photos couldn’t more clearly contrast the width of the expanse between Mana Party and Internet Party constituents. The ‘Key’ question, pun intended, is in what ways they can benefit each other, and us all, through an alliance. For us, the opportunity for kotahitanga is enough. But for there to be oneness there must first be deep understanding. At lunch at the Mana AGM, there was a visible difference between those dining for social reasons or out of habit; and those who were genuinely, ravenously hungry. The only murmurs I heard during Kim Dotcom’s speech at the AGM were when he mentioned his respect for the rule of law. In this country, institutionalised racism, (the common underpinning thread of all imperialistic empire) has resulted in the same terrible health and social statistics for our indigenous peoples, as are also found uniformly in study of “conquered” indigenous peoples all around the world. The privileged white rhetoric of the status quo is that “everyone can make something of themselves” and “everyone can choose to overcome their circumstance” but that is a naive view that doesn’t account for the realities of the warped and utterly dysfunctional socialisation afflicted on so many young children in this country and in others. Very few in our underclasses ever turn their circumstances around. To understand why this is, we must understand the practical realities of their lives. When we enter a shop, anywhere in New Zealand, the shop keeper is usually pleased to see us. Because we are white. Yet often when Maori friends enter a shop, just purely because of the colour of their skin, they are scrutinised and treated as if they are about to steal something at any given moment. The old attitudes of Masters versus Slaves still presides in much of the older generations of New Zealand and you can hear a constant trumpeting of such attitudes across many conventional radio stations and other media. Every person is not born equal in this country and nor are they always treated equally by our state institutions. Therefore the Rule of Law as it is applied to a white man, with or without money, and the Rule of Law as it is applied to a Maori/Pacific Island man, with or without money, is often very, very different and this is reflected in the experiences and attitudes of many Mana members who have too often been on the receiving end of a very short stick where the “Rule of Law” is concerned. Only a few days ago we listened to a middle-aged caller on Radio Live demand to know why Maori could not forget past grievances. To which we say: study Parihaka. We were never taught about it in school. Not one word was breathed, of the children who were stolen. The families who were deliberately estranged by force from each other. Nor what ends they met. Our education system does not educate us on the REAL grievances, which are beyond even just issues of land or money – but the true history of our country and what really happened to it has been thinly concealed, only to be revealed by the intergenerational narrative of those who bore witness, and who remember. So what chance does a person in poverty have, in a land of privatised prisons, and rampant (often unrecorded) crime? 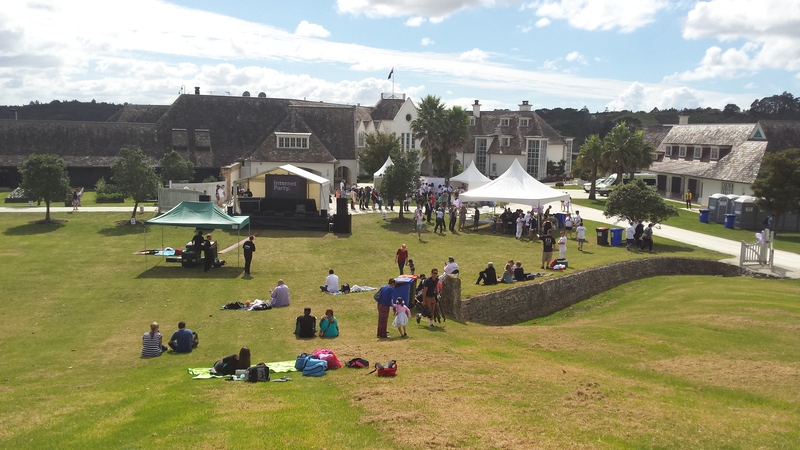 On the flipside everything we’ve heard about Kim Dotcom from those who attended has been positive and even some who were unsure last week have expressed that they are feeling much better about it, post-AGM. Indeed Willie Jackson nailed it when he recalled the Alliance Party wins of the late 90s and early 00s prior to their demise and pointed out that regardless of whether an alliance has sustainable longevity it can achieve some really amazing things in the meantime. We are inclined to agree. Nothing ventured, nothing gained, and it is going to take a radical new direction to break this country out of its servitude to foreign interests. It seems in Kim Dotcom and Hone Harawira, we have two radicals willing to set aside ego to build and achieve greater things together than they could alone. We have long hoped to see a moral left-right alliance to break the media insistence that everyone must fit into either one or the other box. Although the issue is far from decided and no formal declaration of alliance is expected this month, we hope it does manifest itself prior to the Election. The extent to which our land is now being devastated is flabbergasting and only accelerating in pace. If we are to have any meaningful chance at reversing some of the damage, it is already past time to take that plunge. To Hone – this is your golden opportunity to use the media’s own false narrative to your advantage. For too many years, racists have gotten away with calling you racist. Yet you have openly and consistently held Mana open to all races and creeds and lent your ear to any and all who needed you to listen. For as many elderly there are that don’t know a livetweet from a livestream there are abundant numbers of youth who know full well but just don’t realise how easily they can be a part of it. Spread that kaupapa as best you are able. Arm them with technology as it is now the only weapon that counts in the future that is coming to us. The only thing we’ve ever heard from others and seen from you ourselves is that you are 100% for he tangata, he tangata, he tangata. Please continue to teach others what that truly means. More are listening than you know. 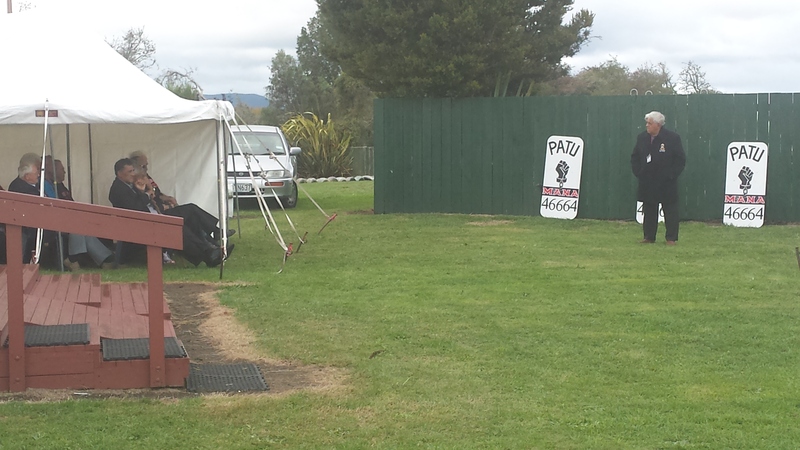 Kia ora to both Hone and Kim for hosting us and for allowing us to interview you. It was without doubt, on both counts, an unforgettable experience. Thank you. All media contained on this site is copyright @OccupyNZ / @OccupyAuckland, all rights reserved.